This has been a very productive year for the Residents Association. The He Ara Pukerua heritage group has installed information boards at heritage sites, the community garden and food forest has plants in the ground, and we have supported a number of community activities. Unfortunately, the year’s achievements were marred by a dispute with the school Board of Trustees over the management of the hall. 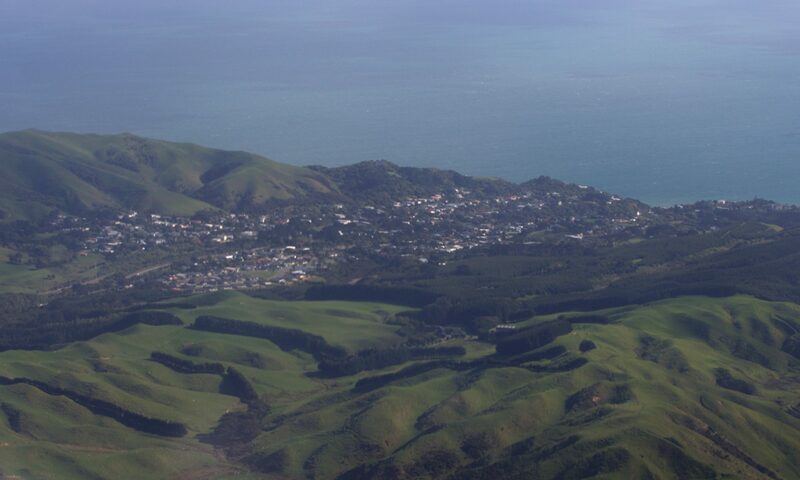 As reported at last year’s AGM, Porirua City Council (PCC) allocated $14,500 in the Village Plan for the He Ara Pukerua Heritage project for the 2017/18 financial year. The He Ara Pukerua steering group has been meeting almost every fortnight. It is continuing with the work needed to bring the project to fruition and has identified sites for three large information boards and 14 additional marker bollards. Over the past year, there have been some tangible signs of progress with the project. On 19 May this year the information plaques were attached to four bollards along He Ara Harakeke. The plaques cover the building of the highway between Pukerua Bay and Plimmerton, the Airlie Road bridges, Taupo Swamp and Winstone’s Brickworks. Timbers from the old Airlie Road bridge were relocated from the PCC nursery in Seivers Grove to Pukerua Bay. Along with timbers already held here, these have been cut to form 12 further bollards and timbers that will form frames for three large signs to be located at the western end of Ocean Parade, the northern lookout and near Muri Station. The metal frames to hold the information boards have been fabricated. The information to go on the sign at the western end of Ocean Parade has been written and is with Ngāti Toa for a final check before going to the designer for layout, then for production and installation. Several of the plaques for bollards are nearing readiness for layout design. A further $14,500 was allocated in the Village Plan for the current financial year. Most of that funding will go on the installation of the large sign and bollards. In addition to the heritage project, the steering group produced the He Ara Pukerua calendar for 2018. This proved to be a successful fundraiser for the Resident’s Association, covering ongoing costs associated with the He Ara Pukerua Heritage project and also the Food Forest. A calendar is being produced for 2019. The food forest has made major progress this year, and several working bees have resulted in the food forest becoming a reality. The garden is being developed on permaculture principles, and the garden group had a visit early in the year from a permaculture practitioner and advisor from Manawatu, Gary Williams, who advised them on practical aspects of developing this site. Approximately one third of the area has been planted in the beginnings of an orchard, along with their nutrient-fixing support trees, and a group of feijoas to operate as a screen between the garden and some neighbours. PCC allocated $7,500 for the 2017/18 financial year, most of which has been spent on a large pile of bark mulch, 35 fruit trees (pears, apples, nashis, plums and feijoas) and around 70 support trees. There were several working bees to prepare the site, plant and prune the trees and build wind shelters for them. PCC has allocated a further $7,000 for the current financial year and this will be spent on buying more fruit trees and plants to add to the existing area and to expand a new collection of different fruit trees. There is a small, active group who do the planning, led by Robert Oscroft, and around 20 people who help at working bees. Everyone is welcome to join in. Ara Harakeke path slip repairs: The slip along State Highway 1 between the shops and Wairaka Road got steadily worse this year, but this is another example of work that involves several agencies, particularly PCC and NZTA, and getting resolutions to these issues always seems to take a long time. PCC has allocated $45,000 in this year’s village planning budget to repair the surface of the path as part of the extension of the Ara Harakeke shared pathway. We understand NZTA will start to repair the slip before the end of 2018. Te Araroa wayfinding signage: In response to complaints about people walking Te Araroa walkway getting lost in Pukerua Bay between the train station and the end of Muri Road, we have worked with PCC and Te Araroa Trust to improve the signage on the route along Sea Vista Drive and across Muri Reserve. Signs have been designed and are being manufactured, and will be installed when PCC has obtained all the landowner permissions. The Pukerua Bay Hall Committee is currently a sub-committee of the Residents Association and has, in one form or another, been managing the out-of-school use of the Community/School hall by the community since 1973. This is an arrangement that was originally established in a 1973 Deed, and continued in the Pukerua Bay School Board of Trustees’ (BoT) hall policy. The BoT this year decided to take complete control of the hall’s management, included its use out of school hours use. They made this decision without consulting the Hall Committee, which their policy requires them to do, and gave the reason that the current Health and Safety at Work Act required them to take this step. The Residents Association’s legal advice was that they did not need to do this, and we told them we would consider taking legal action against them if they did not negotiate a resolution to this issue with us. We are currently in discussions with the BoT to organise meetings on the future management of the hall, and expect this will start this year. We have also obtained from the BoT a detailed breakdown of the handling of the money collected from the hire of the hall in the past nine years, which was another source of friction between the Hall Committee and the BoT. We intend to discuss with the BoT as their report is incomplete and does not align with how their policy says the money is supposed to be recorded and spent. This has been a very disappointing and unnecessary outcome, and we believe this conflict between the Board of Trustees and Residents Association could have been avoided. We remain hopeful we can resolve this issue, for the good of the wider community and its long-standing interest in the hall, but it will take effort and good will from both sides. The Residents Association is happy to support the efforts of the Hub to improve the community life in Pukerua Bay, and appreciate the connection we have through having Hub representative Beccy Davis as a member of the RA committee. She provided the following report. 2017 Christmas on the Field – more than 1,000 people came together on a perfect summers day to celebrate and sing. This event is planned again for 1st of December 2018. Matariki 2018 – bigger and better than our inaugural 2017 event. About 400 people celebrated Matariki with more than 200 counted on the walk through Secret Valley. 500 stars were created as part of the collaborative community art project and used to decorate the Hall. This year the event was opened by Mayor Mike Tana and special guest Miriama Kamo read her new children’s book. We are very appreciative of the PCC Creative Communites Grant, which makes our Matariki celebration possible. 13 workshops have been organised with topics as diverse as children’s art, harakeke weaving, book-binding and wholefoods. Three regular groups have been well attended – Rotten Luck Fermentation Club, Crafty Tuesday and Basketball in the Bay. The PKB Hub team have also organised a number of fundraisers, including the Waitangi Day BBQ, a quiz night and the sale of water tanks, produce bags and stainless steel straws. Ahu Charitable Trust ki Pukerua Bay (our legal entity) was granted charitable status after considerable delays with the Charities Commission. We submitted a proposal as part of the RA’s village planning bid. PCC has allocated a special grant and will work with PKB Hub to help us understand how loneliness may affect our community, and to find more ways to create opportunities for greater community connection. What’s driving this project is our belief that connected communities are happier, safer, more resilient, and better prepared to look after one another. Going forward we would love to achieve more with extra support and involvement from the Pukerua Bay community. For example, help with events like Christmas on the Field, help with planning and running workshops and groups, people to get involved with the PCC funded project, and extra governance support to help us grow. If you are keen please get in touch by emailing hello@pkbhub.org.nz. We kept up our communications with PCC and NZTA on this issue and ran a community survey to gauge the impact of trucks’ engine brakes on residents. We were able to use this information in our discussions with PCC and NZTA, and NZTA has agreed to erect more ‘no engine braking’ signs in Pukerua Bay. We are waiting for their contractors to install them. We were very happy to continue our support for a sign at the beach warning people that little blue penguins come ashore in Pukerua Bay and are in danger from dogs that are not kept on their leash. The sign was finally installed in June and we contributed $260 towards it. This continues to be a serious concern along part of Ocean Parade beach. A PCC contractor placed compacted fill along the bank where it had been damaged by previous storms. Residents were initially sceptical that it would be effective, but it seems to have withstood the battering from storms this year, with only a few repairs required. However, it is only a temporary and incomplete solution and we will continue to work with PCC and residents to ensure a permanent solution is put in place. PCC is preparing a long-term (50-100 years) coastal management strategy and is consulting with communities about this. A number of residents attended a workshop with PCC’s advisers and we urge all affected communities and interested residents to get involved in the ongoing work on this plan. We contributed submissions to PCC and Greater Wellington Regional Council annual plans, and met with PCC planners who were holding initial discussions with communities on their new District Plan. This is due out for consultation in October or November this year. This plan will affect how Porirua develops over the next 10-30 years and we will stay actively involved in its development. We would encourage interested residents to get involved, too. I would like to thank the members of the Executive Committee – Jonathan Harker, Kate Dreaver, June Penhey, Brian Sullivan, Beccy Davis, David Olsen, Pauline Morse, Paul FitzGerald and Guy Marriage – for the work they have done during the year. We have achieved a lot this year. I would also like to thank the PCC staff and PCC and Greater Wellington councillors who attend our meetings and support our community in many ways.